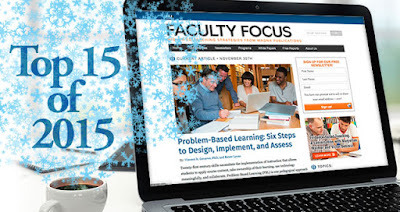 "As another year draws to a close, the editorial team at Faculty Focus looks back on some of the most popular articles of the past year." summarizes Mary Bart, Managing editor of Faculty Focus. Throughout 2015, we published more than 200 articles. The articles covered a wide range of topics, including assignment strategies, cell phone policies, course design, flipped classrooms, online discussions, student resistance, and grading policies.